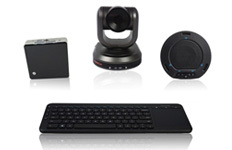 Logitech has brought out the new and improved complete system; the GROUP Video Conferencing System. 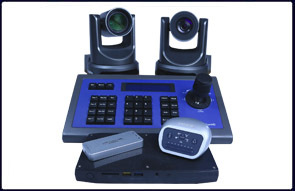 This system includes a camera, speakerphone, remote control, and hub to connect all components to the PC. The Logitech Group Kit with Intel® NUC, configured and validated for performance and compatibility with the VC apps you already use, provides a robust, easy-to-use video conferencing solution that is easy-to-buy and affordable for every room. Note: for full HD support, please check with your software application provider for system requirements.